Get ready for this year St. Patrick’s Day celebrations by dressing up! This special occasion calls for the right attire, and that means that you should pick at least a t-shirt that says that you are up to the task of celebrating as you should. Your shirt should comply with the following requirements: it must be green, it should have some reference to a clover leaf, and it should be funny. As long as you tick all these boxes, you will be ready to party. St. Patrick’s Day requires appropriate attire so that you can prove that you are ready for celebrations. This unisex shirt is an excellent choice for both men and women, although women are advised to order a smaller size than what they usually wear. A combination of cotton, rayon, and polyester, this shirt is beautiful, and it is styled in the timeless crew neck design. The metal raised studs on the front that make the printed image give this shirt a unique look that many people will love. Whether you plan on hitting the pubs or going to a party, this funny shirt will help you dress up for the occasion. 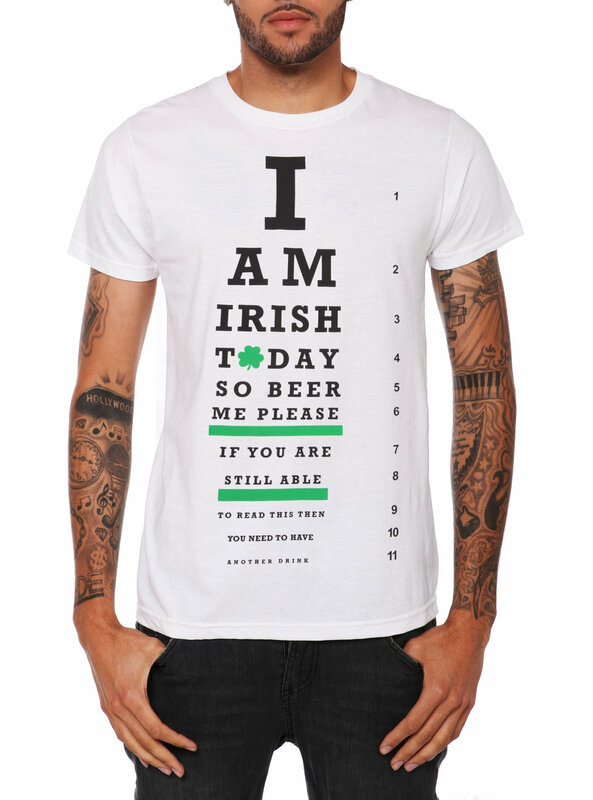 No one says that you will get to wear this t-shirt only on St. Patrick’s Day. Its vibrant colors can make anyone love it, and the manufacturer invests top quality materials and craftsmanship in making sure that their t-shirts are durable and comfortable. The t-shirt feels soft to the touch, and it is very cozy. The material used is ringspun cotton, so don’t be surprised when you will see this tee fitting like a glove. The slim fit design requires you to pay attention to what size you order; if your size is in-between, you should bet on the larger one. With so many T-shirts for sale, you may not know right away what to buy. While many St. Patrick’s Day-themed t-shirts are unisex, you might want to grab one for girls, if you are a woman. A bit more attention to providing a good fit and comfort seems to be invested in this particular model, which means that you will not be disappointed with the overall quality of the product. Made from polyester, the t-shirt is slightly elastic, making for an excellent fit. In the summer, this one will feel cool and comfy so that you can wear it for longer than just one festive occasion, such as St. Patrick’s Day. What better way to ask for a beer than wearing something that practically says that? St. Patrick’s Day celebrations call for a lot of happy drinking, and you should not be amiss from such parties. You will get right into the spirit with this cool looking t-shirt designed primarily for such occasions. The design was created by skilled Michigan artists, and the printing process was supervised by professional printers in the same area. The poly-viscose blend makes this t-shirt an excellent option for hot days. And, the nicest part is that you can compare funny shirts with others when you hit a party. Kids can also join St. Patrick’s Day celebrations, even if they don’t drink. After all, this special occasion is more than just a moment suitable for sharing drinks. You can offer your little one the possibility to understand the traditions and why this event is important. And, to help them get into the spirit, too, you can buy a special t-shirt just for them. The SoRock Magical Unicorn is an adequate design for kids, but it can be worn by adults, too, as larger sizes are made by the manufacturer. You may be happy to learn that this model is also sold as baby onesies, as well. Are you proud of your Irish roots and want to show them off a little on St. Patrick’s Day? This funny t-shirt will do the job. You can also have fun even if you’re not Irish; as long as you feel that your spirit is in synch with all the rowdy parades that take place everywhere on this special occasion, you will be just fine. The t-shirt is made from ringspun cotton, and it is very comfortable. When you wear this item, expect a few laughs, and strangers striking conversations with you. If you’re looking to make new friends, there is no easier way than practically wearing an icebreaker like this one. St. Patrick’s Day is an Irish celebration, but this doesn’t mean that people who are not Irish are forbidden from taking part in all the festive activities. As long as you know how to have fun, you will have no trouble with blending in with the rest of the crowd. However, if you want to point out that you love this occasion, wear this t-shirt. Besides the funny quote, you should know that this t-shirt is made for comfort and durability. It is 100% cotton, and it is available in all sizes. Anyone can wear it, regardless of whether they are men, women, or children. This t-shirt is made in the US, so it abides by the highest standards of quality. If you want to wear something that is comfortable and durable this St. Patrick’s Day, know that you cannot go wrong with this particular model. The preshrunk cotton used for the t-shirt lends it a great feel, so you might not want to get it off once you put it on. The whole point of being part of the St. Patrick’s Day spirit is having fun. If you want to break the ice, wear a t-shirt that says something about your humorous side. The play on words should convince you right away that this fun t-shirt is all that you need to have any St. Patrick’s Day party started. The “Irish You Were Naked” quote will draw more than just a few laughs, and you will find it easier to strike a conversation with anyone. No one says that you should be the one wearing the t-shirt. If you have a friend with an infectious sense of humor, you can make them a great surprise. Also, it is an excellent gift for any occasion, be it Christmas, a birthday, or, of course, St. Patrick’s Day. Saint Patrick is everyone’s favorite holiday for numerous reasons. First of all, you get a day off in almost all industries. Secondly, it is celebrated not only in Ireland and across the UK, but also in Canada, Australia, The United States, and others. Thirdly, you get to wear weird green leprechaun clothes without others giving you the look. And, last but not least, because of drinks. Yes, it is not extremely professional on our behalf to talk about alcohol, but what better way to celebrate Christianity if not by thanking Saint Patrick with a couple of beers or twenty. Saint Patrick’s Day is also a good reason to participate in parades, manifestations, and enjoy the true Irish spirit whether you are a native or not. And this also means dressing up with green clothes or wearing cool message t-shirts. If you are looking for such t-shirts to impress your friends next time or simply want to make a cool gift to a friend, you don’t necessarily have to spend countless hours searching for the most modern models yourself. 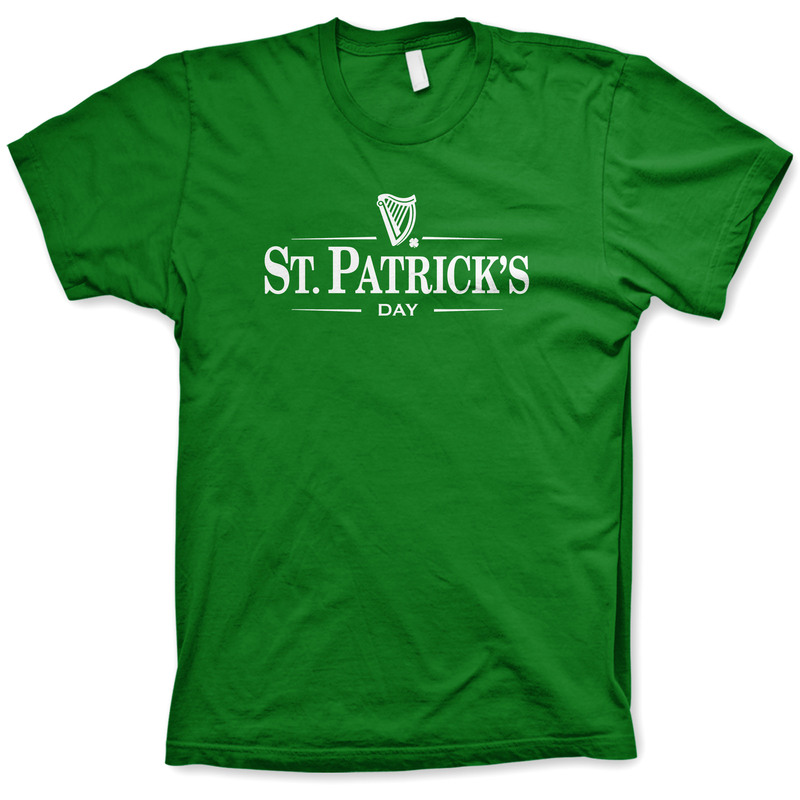 We did that for you and came up with a list of useful tips whenever you want to shop for a cool Saint Patrick’s Day shirt, as well as with some of the most awesome options available on the market today. We encourage you to go out in this day and enjoy the endless amusement possibilities, from private parties to college bar parties, parades or masquerade balls. Apart from Halloween, this is the only time of the year you are allowed to wear the wackiest outfits without anyone judging. Thus, we suggest you take in on this opportunity. If you are a bit more conservative but still want to show off your enthusiasm, we suggest opting for a cool printed shirt. But with so many available options, no wonder you will have a hard time picking the perfect print. Here is what we suggest. The main aspect to look into consideration whenever shopping for clothes is the fabric they are made from. Cotton and organic cotton are the most suitable options for men because they are made from natural and breathable fabrics with important moisture-absorbing capabilities. Cotton t-shirts come in a wide variety of prints, but the most important utility is that they will keep your skin dry and warm throughout the day, without leaving a sense of discomfort. Mixed shirts from cotton and poly fibers are a cheaper solution and also perfect for those who want their shirts to be nice and stretchy. We recommend using these shirts less often than regular cotton shirts and avoid placing them near direct sources of heat or fire. Another extremely important aspect to bear in mind whenever buying shirts is to give some thought to the correct shape according to your own body figure. If you are slightly overweight or chubby, we suggest hiding your belly and extra fat with loose figure items. On the other hand, slim cut t-shirts are suitable for those who go to the gym or want to show off their specs. The cut of the shirt is very important because it will define the area of your outfit and help you create clean cuts and studied outfits. A polo shirt cut will work better for regular, more formal parties as it adds a touch of elegance, while round-collared shirts best match with informal, casual clothing. Always make sure to buy shirts according to your size and body shape if you want to look good. Too tight or too large products should be avoided because they are not flattering anyone, but merely bring to light all of your body flaws. When it comes to the style of your shirt, Saint Patrick’s Day is a good opportunity to let loose and settle for everything inconvenient and even inappropriate, sassy or slightly cheesy. The most popular style of shirts is the one with printed pictures or messages suggesting a particular state of mind or desire. And, since we are talking about the holiday from March 17th, you just have to add some of Ireland’s fundamental symbols – beer, leprechauns, and trefoils. Most of the messages for this day are funny, and we do consider this is the perfect way to show off your creativity and sense of humor. Depending on your own personality or the type of comments you want to attract with the new outfit, you will choose Saint Patrick’s Day shirts Ireland’s symbols. On the other hand, if you are funny enough to make a statement, we suggest picking funny printed t-shirts. Last but not least, consider color-appropriated shirts for the next Irish party. We suggest avoiding patriotic colors like the blue, red, and white found in all American goodies but to rather embrace the Irish culture, at least for a day. Thus, you have to choose between various shapes of green, black and white. That’s pretty much it. The main drawback about these themed shirts is that you only have a limited amount of time yearly to be wearing them. Since Saint Patrick’s Day is in the middle of the spring, you cannot correlate it with any other religious or commercial international event, leaving you with only a couple of days for proper wearing the shirt. Thus, we suggest you invest in regular cotton shirts with qualitative prints rather than in luxurious items. At the end of the day, it is only a holiday and, no matter how Irish you want to become once a year, you won’t get to wear your special t-shirt more than a couple of times before the “season is over”.